Anders first joined us as a detailer, but quickly worked his way up to the Service Apprentice Program. He began his apprenticeship as a Service Technician in 2017. He enjoys that the team is quick to jump in and help whenever and wherever needed. 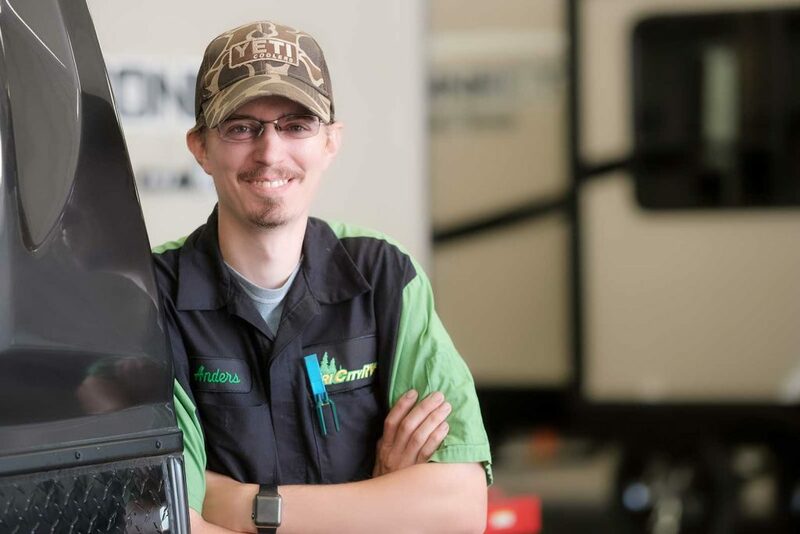 “I also love seeing the happiness and satisfaction for every customer who joins the Tri City RV family.” Anders is a self-professed tech junkie, so he spends his free time around or on computers. He constantly seeks to expand his knowledge. He also loves washing and detailing his own vehicles as well as those belonging to his family and friends. Camping is a great way to escape and a way to connect with nature. And the RV Industry has enticed more people to do it. I love barbecued chicken and corn on the cob cooked over a campfire. So far, my favorite place to camp is along the Rifle River. The history of the campground is quite interesting and there are tons of trails to walk as well as plenty of areas to go kayaking. One thing I love about America is the country’s diversity. I’m grateful for all the opportunities I’ve been given and everything I have. I wake up everyday to a beautiful sunrise over the Bay and to a family to share it with. I pledge to make sure every Tri City RV Customer leaves happy, no matter what it takes. If the customer isn’t happy and smiling, neither am I.